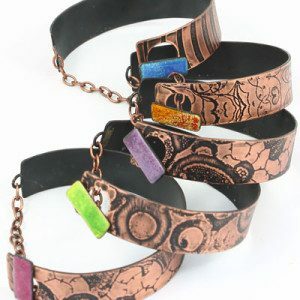 Gwin Kerry is a Derbyshire based jewellery designer, specialising in vitreous enamel on copper, whose designs celebrate colour, materials, emotion and memory. 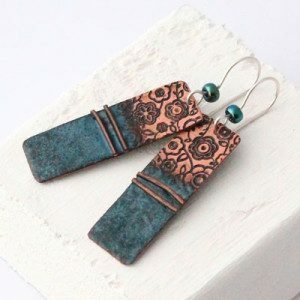 Since 2013 she has been developing a growing range of jewellery, gift products and craft ware aimed at those who value creative British craft, the freedom of individuality and people who appreciate texture, colour and shape. She sells her products mainly at local galleries, craft fairs and events, but she is beginning to grow her supplier base nationally as demand increases. 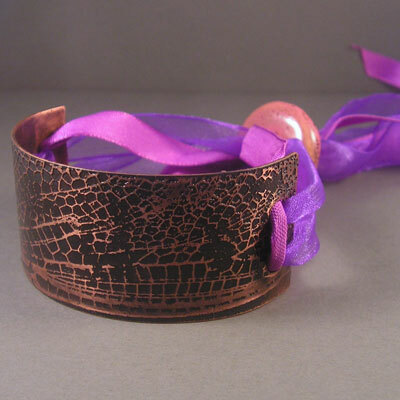 Gwin, we spotted your copper jewellery at a craft fair and couldn’t resist it! Please can you explain the process you use to make it? Thank you! After the design process which usually happens in my sketchbook, my jewellery starts out as plain copper sheet. 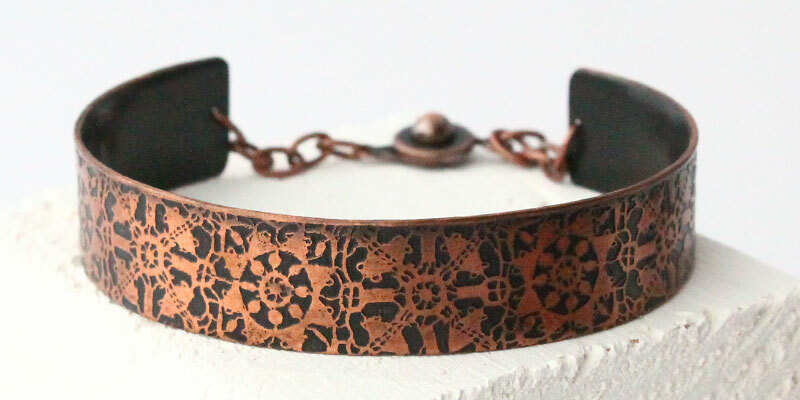 I print designs onto transfer paper which is transferred to the copper making a resist, then etch the copper in an acid bath – this makes a patterned texture. 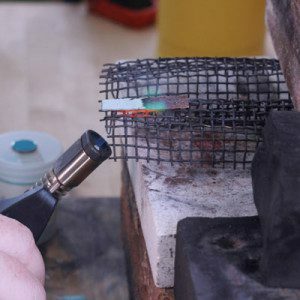 After this, the jewellery is coloured using powdered or wet-process vitreous enamels which are torch-fired, creating the beautiful glass-like decorative coating. Jewellery is then filed and finished to a high quality and lacquered to prevent tarnishing. I have always been creative. 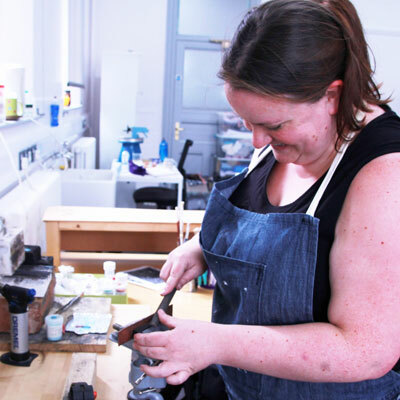 After studying Art and Design at Chesterfield College, I studied Applied Art at what was then NEWI (North East Wales Institute of Higher Education), gaining my degree for which I specialised in ceramics. Later after a period of illness and several jobs I worked as a design and technology teacher. I taught myself enamelling initially as a hobby that I could do at home without much space and outlay. What gives you the inspiration for your designs? I’m very sentimental and have strong visual memories of growing up. Consequently many of the colours and patterns I use are related to household and clothing designs of the 70’s and 80’s and they relate to particular emotional memories. Others are directly linked to living in Derbyshire. I love talking to customers about the associations they make with particular colours and textures – everyone is different. I’m lucky enough to work in West Studios which is a new ERDF (European Regional Development Fund) project that has been set up in Chesterfield College. We have roughly 16 business tenants working in newly refurbished spaces. I share a lovely airy old grammar school classroom with three others: Sarah Pasley, an accomplished silversmith, Deborah Langner who is a ceramic artist and Miriam Griffiths who designs fabulous knitware. For more info please check us out on Twitter @WestS4 or search for us on Facebook. What is it like sharing a studio with other ‘women who make’? 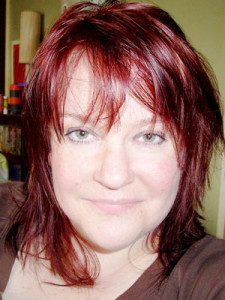 I first set up my business at home, which worked on many levels, but began to get isolating. Sharing a space with like-minded women who all have their own routes into business and creativity is both supportive, inspiring and a driving force. We are lucky enough to all get on with each other and have a great working ethos where we can freely ask each other for advice. Together with the support we have from West Studios it’s a powerful thing knowing that you aren’t alone in what you are doing, even though your business is solely your responsibility. How have online channels like Folksy and Etsy given you access to new customers? There is nothing to compare with meeting my customers face-to-face, but Folksy and Etsy are both enormous marketplaces. They put me in touch with people who otherwise would not have come into contact with me or my work. I was recently a featured maker on the front page of Folksy, which was a massive boost to my profile. I also use Folksy as a trusted platform that my customers can use to order and pay for custom and bespoke items if they wish. Is there a tipping point where an artisan maker becomes a mass producer? Is there any such thing as ‘too big’ when it comes to a ‘small’ business? That’s a big question! At the minute everything I make is unique. It doesn’t mean I’d say that I would never become a mass-producer, but being a maker is part of who I am; I couldn’t imagine myself sitting in an office employing other people to mass produce things for me abroad. I am moving more and more into small batch production methods to keep up with demand but I will always want that final say about the quality and feel of each item that has my name to it. As to there being such a thing as ‘too big’, maybe not. But I honestly feel that as a craftsman or artisan you do have to be genuine. I like that as a small business I have a direct relationship with my customers and they know exactly who they are dealing with. If I find a way to stay true to my ideals and move into larger production or retail methods then who knows what I might achieve? What are the biggest challenges you’ve had to overcome to get going and keep going in business? I might say funding my business (I started with nothing) but actually the biggest challenge was working from home before I moved into West Studios. I live in a tiny flat with an untidy partner and an enormous dog! There was limited room for me to work and as I mentioned, before it was quite isolating which began to have impact on my health and consequently my output. What are your tips for other women looking to develop their own craft based businesses? Be authentic. Make things you really love, then go out and show them to the world. Don’t be afraid to make the most of opportunities, be open to new ideas and allow yourself to make mistakes, but always have a back-up plan for if things go awry. That doesn’t mean not taking risks – it means understanding that you learn from failures and mistakes and move forward. How are you looking to develop the business further? I am currently supplying some local stockists with wholesale products and I hope to expand this. I’m looking forward to the New Year, which is my time to design and develop new ideas and techniques for new products. I would like to produce a collection of jewellery which I can then market to galleries. Additionally I have started to look at ways in which I can provide training and experience to other makers in a way which will also allow me to grow to my business; perhaps with apprenticeships, internships or work experience routes. I really enjoyed reading this interview, thank you! Especially where Gwin talks about being authentic and making the most of your opportunities – very inspiring!